3) 7 nights - Monday to Monday or Friday to Friday. Where the calendar only shows prices for the 3 and 4 night breaks but you actually want a week instead, then please get in touch and we will be able to lower the combined price for those dates and give you a better price. 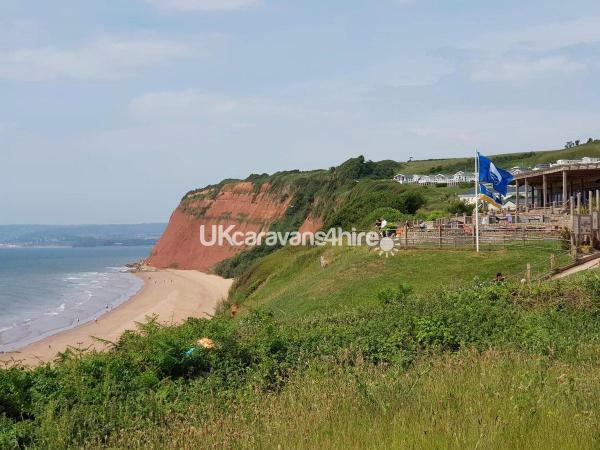 Our Luxury Platinum caravan is situated on the Haven Devon Cliffs site in Sandy Bay, Exmouth, the flagship park of Haven. 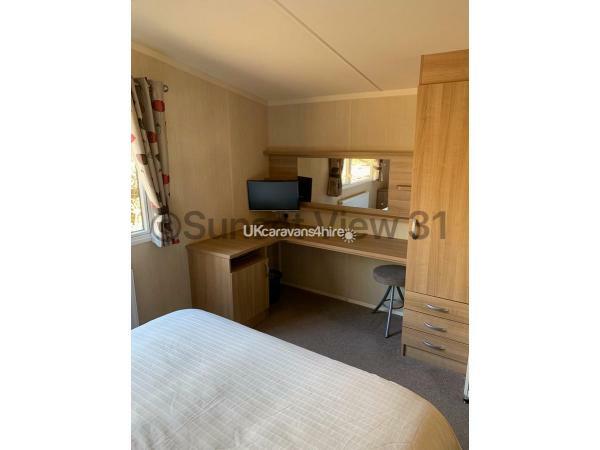 This is a much loved and well looked after private caravan with 2 bedrooms and a large veranda with outdoor furniture. 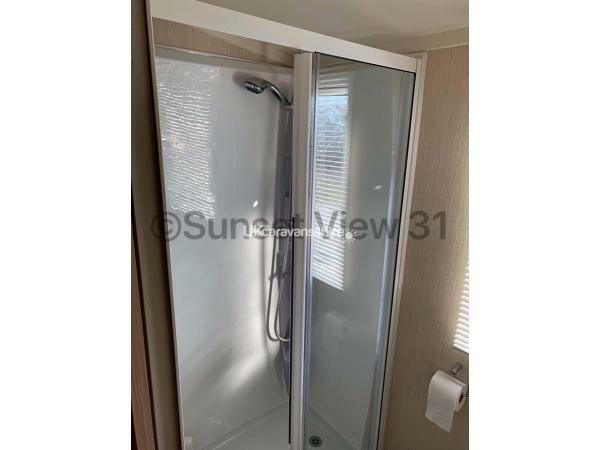 This premium pitch has a private driveway and is situated at Sunset View near the top of the park in a cul-de-sac location, so is safe for the children and free from passing traffic. Despite its quieter location it is still only just over a 5 minute walk to all the facilities so the best of both worlds! 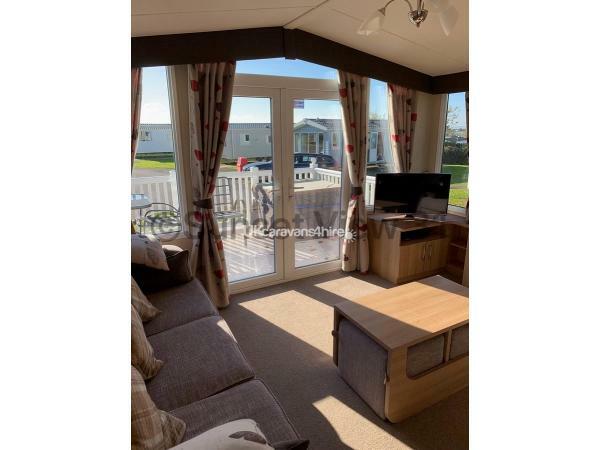 Our holiday home is double glazed and has central heating so is ideal for a holiday or mini break at any time in the year. Lounge Area - Ample and comfortable free standing 3 seater and 2 seater sofas, flat screen TV, coffee table with 2 additional stools and gas fire. 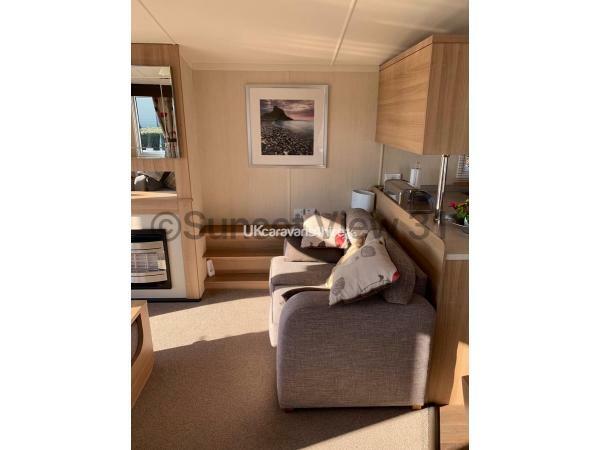 The settee in the lounge can be made into a further double bed so the caravan can sleep 6 in total. Dining Area - There is a freestanding table and chairs. 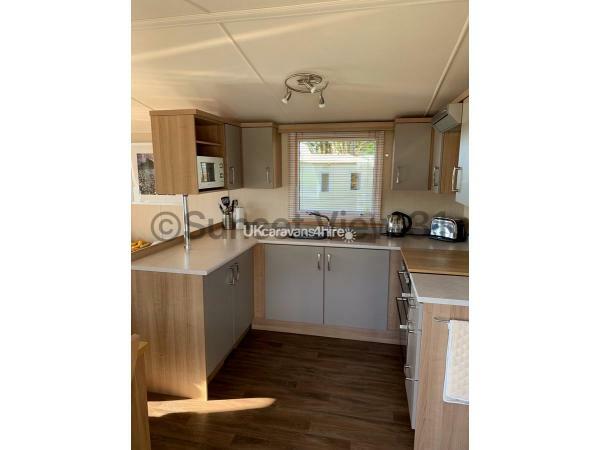 Kitchen Area - Fully integrated kitchen with everything you will need, with integrated fridge freezer, microwave, toaster, hob and cooker. All inventory and utensils are provided for cooking including all saucepans, crockery and cutlery. The only thing you will need to bring are sponges and tea-towels for the washing up. 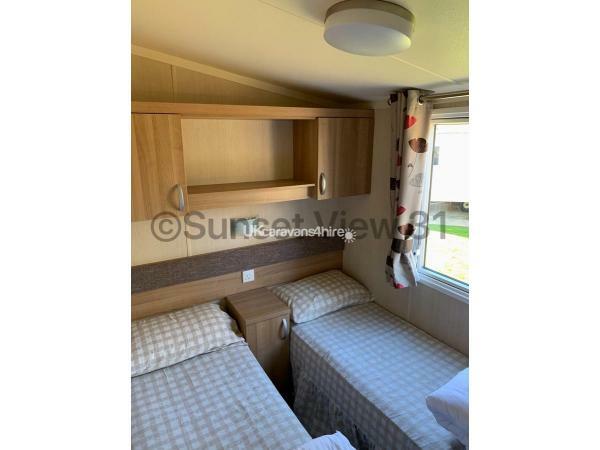 Bedrooms - The holiday home has 2 bedrooms and WE PROVIDE ALL BED LINEN for your stay included in the price as well as duvets and pillows, so all of this is taken care for you before you arrive; so less stress for you on arrival day. So you only need to bring your own towels. 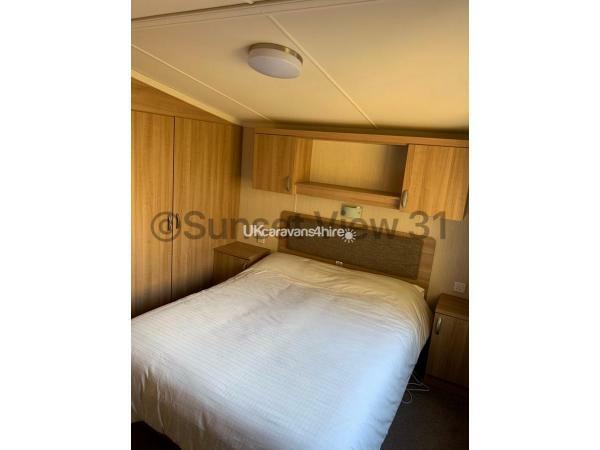 The main bedroom has a King Size Bed with room for a travel cot (provided if requested in advance) and also has its own ensuite toilet and sink. The second room has 2 twin beds, so together with the pull out bed in the Lounge this means maximum occupancy is for 6 plus a travel cot. 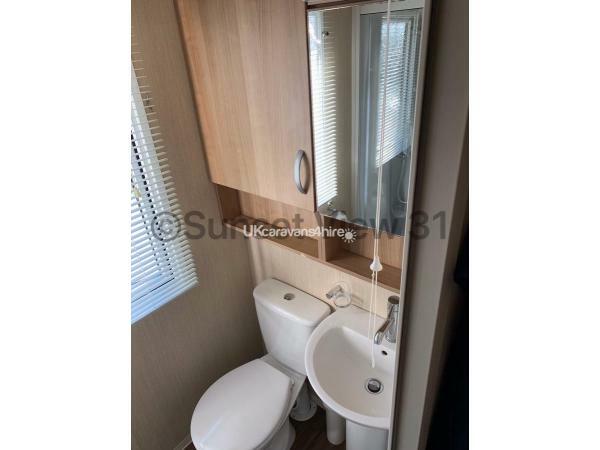 Bathroom - Double shower with glass sliding door, toilet and wash basin with mirrored storage cabinet. 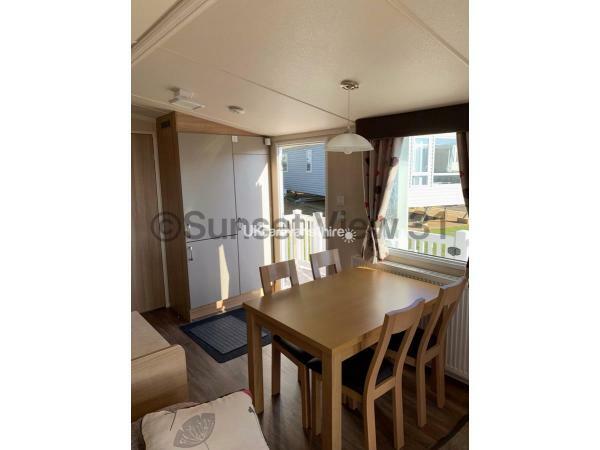 Veranda - The holiday home has large gated decking with furniture, so you can relax in the sun, eat and socialise. 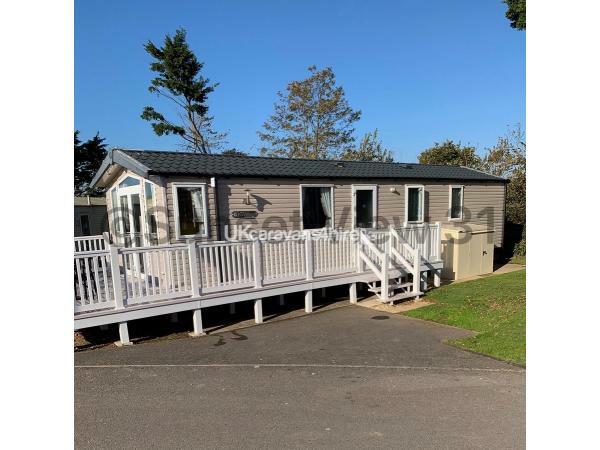 Key pickup - The keys are kept in a key safe located at the holiday home and you will be issued with the code prior to your holiday starting - so great news, no queuing at reception when you arrive! Check in on arrival day is from 2pm and you must have left by 10am at the latest on your day of departure so we can clean the holiday home ready for our next guests. 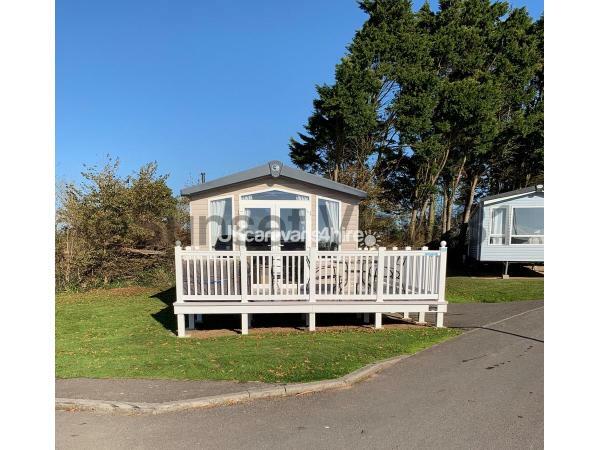 We love our holiday home and want it to stay clean and fresh for ourselves and all of our guests, so we have a strict no smoking or pets policy. We require 20% of Holiday Price as deposit to secure your booking with the balance payable 6 weeks before your holiday. Further details will be provided on the booking form after initial enquiry. Haven Entertainment Passes can be purchased separately from the main reception upon arrival or in advance direct from Haven before you arrive - all passes are an additional charge payable directly to Haven. If you have any questions then please contact Jon or Karen on 07737 028136. Additional Info: Devon Cliffs is Haven's flagship park and is fully equipped with amenities and activities to keep you and your children happy for hours. We have indoor and outdoor pools (outdoor in peak Summer season), as well as our own blue flag beach with water sport activities should you wish to take part. You can use the all-weather sports pitches, archery, segways, crazy golf, climbing and zip lining in the trees (Like Go Ape) and many other activites. Many of these amentities are accessible with a Haven Entertainment Pass, which can be purchased separately from the main reception upon arrival or in advance from Haven before you arrive - all passes are an additional charge payable directly to Haven.There are 2 show bars with plenty of entertainment for both parents and children, a Sports bar and large arcade. There are 2 main restaurants and also plenty of other outlets such as Burger King, a chip shop and Papa Johns Pizza. For those who want to cater for themselves, there is an onsite supermarket which is very reasonably priced.